One of my favorite things in the world is eating out at a restaurant. I do like to cook, but the experience of sitting down with your people, ordering what you want and it being brought to your table like magic is my favorite. When I was a kid, we always ate out on Friday nights. We would go to Rax for a roast beef sandwich and salad bar, and then shopping at Hills Department Store. My own family has our own days where we usually will go somewhere for dinner, but Sundays are always iffy. One of us will usually ask on the way home from church, What’s for dinner? Then it’s the usual, “Whatever you want is fine,” and so on, until someone finally makes a suggestion. Almost always I will say, “Are we talking restaurant, or something at home?” And my mood can completely change. I don’t know what is, but when the option of going somewhere fancy is dangling there, and the choice is to go home, it is a complete mood changer for me. In Mark 5, there was a guy who didn’t want to go home either. The chapter starts with the Jesus and the disciple on a boat. Jesus had just silenced the storms on the lake, and he and the disciples were traveling to land when a “madman” ran straight for Jesus, dropped to his knees in front of Him and was screaming to Jesus. Jesus told the evil spirits to get out of him, and the spirits pleaded not to be tortured. They asked Jesus to let them go in a huge group of pigs that were nearby, minding their own business. Jesus okayed that and the spirits jumped into the pigs and the pigs jumped off a steep bank into the lake and drowned. For some reason, this freaked the village out and they asked Jesus to leave town. But back to this guy – the demons left, and here he is, now with clothes on and completely sane. This is when Scripture said people became afraid. This is a guy who at the beginning of the chapter was untamable. He ripped through chains that tied him down. No one was strong enough to control him. He spent his days screaming and cutting himself in the graveyard. Now here he is, completely fine in normal everyday clothes, having normal conversations. This guy’s life had been completely changed, and he wanted to be near the One who made it happen. He begged to go with Jesus. But Jesus said No. The guy could have been insulted, feeling like Jesus didn’t want him around, but the truth was that home was a bigger mission. He could have followed Jesus around and watched Him doing all the miracles, or he could be back with his people and sharing what happened with anyone who would listen, spreading the name of Jesus even farther. Jesus knew the better option. The demons begged Jesus to let them leave, and this guy begged Jesus to let him stay. But Jesus knew best. This guy’s story would make a difference, and not just to his family and friends, but to his entire town. Jill Briscoe is, among other things, a wonderful speaker. If you have never heard her, you need to. Anyway, in a sermon she was giving, one thing she said made such an impact on me. The perfect formula for obedience. Our guy in Scripture did this very thing. He went home where Jesus sent him, he stayed in his town, and he told his story, just like Jesus told him to do. This resulted in an entire town amazed at what Jesus had done. If you ever feel like your calling isn’t big enough, I hope you can remember this. I’m sure being one of Jesus’ followers would have seemed like a big deal, and just going back home was completely ordinary. But his ordinary calling is what made the most difference. Even the things that seem simple or ordinary can be made into something extraordinary in the hands of Jesus. Your story might not seem big enough, but trust me, it is. Someone is needing to hear it. I’ve only been to one wedding vow renewal. It was unusual for around here, with Celtic music and a procession of flags. I wasn’t at the first wedding, so maybe it was some kind of throwback to that. Who knows? There are lots of reasons people give for having them. Sometimes it is to mark a special anniversary, 10, 20, 25 years (I think this was the reason for the one I attended). Sometimes a renewal is done after a difficult situation the couple has overcome – a rough patch or an illness, etc. And sometimes it is simply to let the world know they would do this all over again. While Shawn and I have experienced all these reasons, neither of us would want to do a ceremony. He said he meant it when he said them the first time, and I’m not a fan of being the center of attention. But they can be a beautiful thing and important for a lot of people. It’s all too easy to completely love your person and mean all words you promised them on your special day, then life and laundry and bills get in the way. Sometimes it’s just important to take some time to remember why and confirm it again. Then Jesus turns it to them at the beginning of verse 29. I think Peter knew before that day that Jesus was the Messiah. And I think Jesus knew that Peter knew. But I also think Jesus knew it was beneficial for Peter to press pause for a second and let the question sink in and confirm it once again. I *do* believe You are the Messiah. Maybe you are like me and could benefit from doing this today too. Pause for a second and ask yourself, “Who do you say He is?” “Who do you believe He is?” Let’s remind ourselves of the things we have seen Him do, and the things we read He did in Scripture. Write those things down if you are near a scrap of paper or your phone. Let it sink in for a minute and remember who we say He is. Noah and I were finishing up the day with an episode of “Chill with Bob Ross” on Netflix. Bob’s canvas was covered with a mix of Titanium white, Prussian blue and Midnight black across the top for the sky, and a slightly darker version of the mixture for a pond beneath it. He had just blended it perfectly and it looked beautiful and serene. Bob is a genius. Everything he paints turns out top-notch and he does it in a way that calms us, with his kind, encouraging words. In this episode he even had a tiny bird perched on his finger while sharing memories from his childhood. He has a way of lowering your blood pressure in just one episode. Even though I know he is going to do something incredible, when he takes that metal painting knife covered in a dollop of midnight black and drags it right down the center of his masterpiece, I’m sure for a moment that he has completely ruined it. That this episode is certainly the one time he regrets what he has done and we all feel sad. But then he starts fanning the paint out, a little to the left, a little to the right, and continues it to the bottom of the line of paint. It turns into one of his happy little trees. Even then, I think, Are you sure Bob? Right in the middle of the water? Trees don’t grow there. I don’t think this is right. I keep my eyes glued to the screen and watch him as he then grabs a different brush and starts fanning a darker shade of paint southward and it turns this tree in the middle of the sea into this tiny edge of a snowy forest on the side of a pond, complete with reflections on the water. I don’t know how he does it. As I was questioning Bob, the questions and doubts felt familiar. I have asked God the very same things. I see my life or the lives of the people I love and how things are going great, pretty smooth and pretty easy, when He suddenly drags the painting knife right down the middle in a harsh shade that doesn’t seem to go with everything else, and I start to question. What are You doing? Things are good, why do You need to add this? What is the purpose? There is no way this can turn into something good. This is the one time You have made the wrong move. But, of course I’m wrong. He knows what He is doing. Every single time. It doesn’t always turn into a happy little tree so quickly, but it gets there eventually. Sometimes even the finished product doesn’t look like we think it should. But we aren’t the Artist. He is the One with a plan, and all the steps along the way to see it out. If you are finding yourself in the middle of your fresh, seemingly misplaced, line of harsh paint right in the middle of your easy-going canvas, this is to remind you that you aren’t alone and that often these steps are needed to get the result we will really want the most. Trusting is hard. But when you can remember time and time again how faithful and right God has been in your life, and then remember all the times you have heard your friends and family talk about how God came through for them, and then recall the stories written in the Bible, where we see God showing up over and over – our trust can grow a little bit more. He has a good track record and I promise He knows what He is doing. Little bits of twigs, string, and mud all smooshed together to help our back porch lights become a housing community for our neighborhood birds wanting to start their families. We were delighted to see a new nest this year with three teensy eggs and two loving parents patiently caring for their new bundles of joy. It is so fun to watch. First the nest is built, then the parents are waiting and waiting, taking turns keeping their precious eggs warm and protected in the wind, rain and unexpected snow. Before long, tiny bald heads peep out over the top with their beaks wide open, anticipating Mom or Dad’s breakfast runs. I love watching them, but it seems to go by so quickly. I remember a couple of years back when Noah was turning 15. He had gone to the movies with some friends and Shawn and I were eating in the food court. My friend Mona walked by and was chatting with us for a minute, where of course I lamented how quickly time is flying by and I don’t want Noah to grow up and it’s all going to be over soon, blah blah blah. Then she shared words of wisdom with me, saying how it is normal and natural for things to grow. She said, “When baby birds grow up, they leave the nest. Wouldn’t it look so silly to see a nest full of grown up birds all stuffed in it?” It was a funny picture in my head, but it was words I haven’t forgotten. She was right. When the time comes, they leave the nest. It is the way it is supposed to be. Another wise woman, my mother-in-law, said how she has enjoyed every single part of her kids’ lives. She doesn’t mourn for the parts that are over, she embraces what is happening right now. And I think that can be true for all of us, with or without kids. Whether you are a new parent, missing the days when you can sleep in, or one who just watched their last child graduate from high school. Whether you just retired from your job, or are moving a parent in to live with you. Sure, there were great parts about what we just finished, and we can be thankful and delightfully remember them. But there is something good right in front of you. I don’t pretend to know everything. Some of you might be going through the toughest times of your lives right this moment. But I can tell you that there is something to embrace and be thankful for even then. During some of the toughest times of my life, I have found that’s when I find myself scooching closer and closer to God, and those are times I wouldn’t trade for anything. Learning to depend on Him, trust Him, and know Him better through time in Scripture and prayer have all been more of a blessing than I could have anticipated. He doesn’t waste anything. During those really hard, icky times, there is always something we can learn. And there is always something we can give. A friend who works in Hospice shared with me this week how that is a struggle some of her patients go through. They wonder how God can use them and what purpose their lives can have while they are confined to their bed in a nursing home. She said it’s harder to accept, but that sometimes that purpose isn’t something for them, but for someone else. The purpose might be that someone else sees how you can have joy even through suffering, and through that learn more about this Jesus that you are longing to see. If you have breath, you still have purpose. Keep your eyes peeled and your hearts open to whatever God has for you in this day, in this moment. 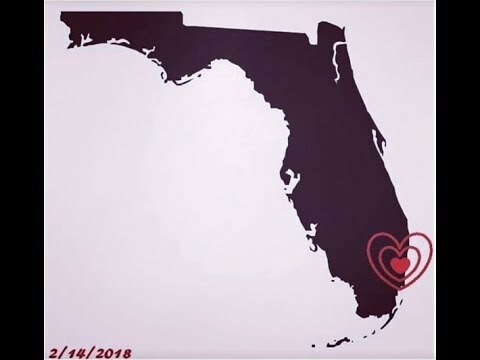 What happened in Florida has broken my heart. The tears kept coming as I saw the faces and heard stories of those who died. The tears come as I think of the mom who made it her life’s mission to love and care for this boy who would ultimately end the lives of 17 innocent people. My heart breaks wondering why he did it. Wondering if there was anything at all that could have prevented it. I have no idea what the right answer is. I felt helpless and fearful. Wednesday evening we were researching bulletproof backpacks, and it breaks my heart that that even has to be a thing. Thursday morning, I didn’t want to send my son to school and I am sure I am not the only one who was feeling this way. I pray with my son every day on the way to school, and every night before bed, asking God to protect him, and protect his school, and his friends. I am also certain I am not the only one who does this, and I wonder which Parkland moms were praying that Wednesday morning as their kids left them, and wondering how those moms are making sense of all of this now. It leaves me wanting heaven. Wanting the day when Jesus makes it all right again. But here we are. While a good bunch of people will be talking to their representatives and leaders, asking for law changes and action, it can leave the rest of us just hoping something changes but feeling powerless to make it happen. There is something we can do though, and we can do it today. Keep your eyes open. Look for people around you who are alone, who are different, who are hurting. Talk to them. Care about them as if they are your kid, your sister, your dad. If you are a teenager, look around the room. You will see kids at school, at church, at practice, sitting alone quietly, not quite feeling included. Please talk to them. Not in a pity way (though even that is better than nothing) but in a way that Jesus would. In a way that wants to really know them and sees value in them. Everyone has value. If you are an adult at church, look for that kid sitting alone. Ask about what he does for fun. What he wants to be when he grows up. Take a genuine interest in his life. Pray for him, and ask him for specifics on what he needs prayer for. Follow up the next time you see him, asking how his test was, or if he saw the latest episode of whatever his favorite show is. Love him like Jesus would. It might be weird at first, but it is so very valuable. If you are a neighbor, get to know that girl who walks by your house. Intentionally be available to make conversation. Find a way to show her that you see her, and that God made her for a purpose. And this doesn’t just apply to teenagers. Look for the lonely adults, the people your age, the ones older than you, anyone who could use someone to value them. I am preaching to myself here too, because sometimes I am lazy, and skip the conversations. We can do better. I am not saying this will stop all, or even any of the shootings, or that I have the answer. But I think it is a good place to start.